Palm-sized tabular with the right curve to fit yours, this Arkansas multi-terminated singular is full of the rarities that will make this your special, powerful piece...Elestial. Regrowth. Rainbows and rare iris colorations - the latter is what jewelers would cut from rock crystal to sell as opal. Many many record keepers for you. 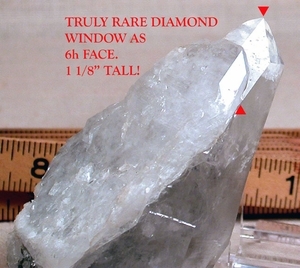 A truly stupendous - beyond - rare diamond window as a 6th face which is 3/8x 1 1/8" tall. Fine, dark phantom behind skeletal habit - landscape glyphs. Contact layers in the first suede of regrowth. Sent gift boxed with hand written description. Shipping will be added.